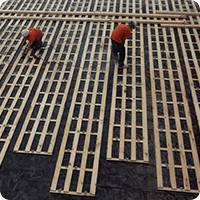 This anchored resilient system utilizes factory assembled panels with natural rubber pads and allows air circulation throughout the subfloor structure. The Aero NR also allows complete movement as a system when the floor expands or contracts. 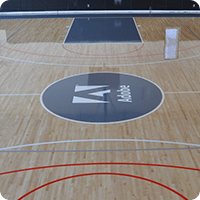 This floor system is highly resilient, has uniform playability and consistent shock absorption to enhance safety for athletes. Action’s Aero NR Floor System is an excellent choice for gymnasiums, multipurpose, indoor running, dance floors and aerobic projects. This anchored resilient system utilizes factory assembled plywood panels with natural rubber pads, continuous steel channels and recycled anchoring T-blocks to provide a system with dimensional stability. This floor system is highly resilient, has uniform playability and consistent shock absorption to reduce injuries to athletes. Action’s ChannelFlex Ultra NR Floor System is an excellent choice for gymnasiums, multipurpose, indoor running, dance floors and aerobic projects. This floor system utilizes high performance 7/16"(11mm) natural rubber pads attached to a durable laminated sleeper retained within an anchored continuous steel channel to deliver a floor system with stability, and strength. This creates a floor system that is highly resilient, has uniform playability and consistent shock absorption to maximize the athletes comfort and performance. The Action PowerChannel Floor System is suitable for high performance arenas, gymnasiums, multipurpose, indoor running facilities and stages. This anchored resilient system combines laminated sleepers and plywood to provide a system with dimensional stability, strength, and great ball response. 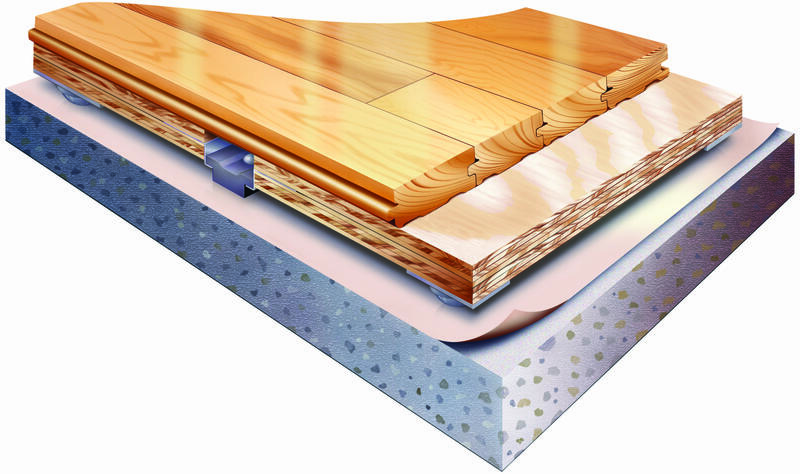 The Action ProAir AR floor system combines AirTech natural rubber pads, anchored resilient laminated sleepers, plywood, and Action maple flooring. Action ProAir AR Floor System is an excellent choice for gymnasium projects. This floating resilient system provides uniform performance and great ball response. The Action Thrust I floor system combines our Air Thrust natural rubber pads,two layers of plywood and Action maple flooring. The Action Thrust I floor system is an excellent choice for gymnasiums, multi-purpose rooms as well as aerobic and dance floors. This floating resilient system provides uniform performance and great ball response. The ProAction Thrust floor system combines our ProAction variable load response natural rubber pads,two layers of plywood and Action maple flooring. The ProAction Thrust Floor System is an excellent choice for gymnasium projects. This floating resilient system provides uniform performance and great ball response. The ProAction Flex floor system combines our Air Tech II natural rubber pads, two layers of plywood and Action maple flooring. The ProAction Flex Floor System is an excellent choice for gymnasium projects. This floating resilient system provides uniform performance and great ball response while virtually eliminating dead spots. The Action Cush I floor system combines our resilient pads, two layers of plywood and Action maple flooring. The Action Cush I Floor System is an excellent choice for a multitude of situations from gymnasiums, multi-purpose, classrooms, racquetball courts and commercial applications. This floating resilient system provides uniform performance and great ball response while virtually eliminating dead spots. The ActionFlex Floor System combines our multi-cellular closed-cell foam,two layers of plywood and Action maple flooring. The ActionFlex Floor System is an excellent choice for superior quietness and vibration control. The ActionFlex can be used in a multitude of situations from gymnasiums, multi-purpose and dance or aerobic applications. Learn about the important environmental conditions that the MFMA recommends for installing a floor. Learn how to tke care of your wood floor once it has been installed. These guidelines and recommendations will keep your floor looking great and meeting you athletic performance expectiations.